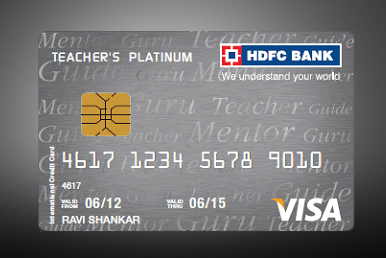 Another segment of HDFC credit cards is Teachers Platinum card specifically designed for people of respectable professionals – “Teachers”. This card comes under professional credit card segment, we reviewed one recently for doctors which is Doctor’s Superia. I should say, Teachers Platinum is better than Doctor’s superia. This card for teachers offers them special features like multiple reward points, special weekend shopping offers, petrol surcharge waiver and special gift of reward points every year on Teachers Day to give them a tribute by HDFC. Since with a long tiring week when on weekend teachers go out for shopping they are offered 3x reward points on every Rs 150 spend, i.e. usually you receive 2 reward points on every Rs 150 spends but on spending on Saturdays or Sundays they receive 6 reward points on every Rs 150 spent. Also the card is entitled to bonus gift of 500 reward points every year on Teachers Day (5th September). You can also share this card as add on with your relatives or spouse or children etc free of cost for life time and 3 add ons can be taken on this single primary card. Another offer which banks these days offer on the card to make the card life time free and annual charges waived off is that it has started offering an insta loan of Rs 12000 @ 1.1% p.m. availing which can make your card life time free without any annual charges. Reward Points: 2 Reward points earned on every spent of Rs 150 on any week day while 3x reward points on spends of every Rs 150 made on Saturdays or Sundays. Fuel Surcharge waiver: The fuel surcharge applicable on the card is 0% which is capped at Rs 250 per billing statement. You can save up to Rs 1500 in a year on your fuel transactions assuming that you consume fuel of Rs 5000 in a month. Free Ad ons: You can get life time free add on cards to a maximum of 3 add on cards. Renewal Fee waiver: The annual fees of the card is Rs 500 for the first year but if you spend Rs 10000 within first 90 days from date of receipt of card the annual fees will be waived off and from second year onwards you need to spend Rs. 50000 in the entire year to get your fees reversed. The card is one of the best in professional segment since the features are unique in its own way by giving 3x reward points on weekends. Generally people get time on weekends to go out for shopping since they are considered giving their entire week on teaching their students. And rewarding 3x reward points is a bonanza offer to their work. Though belongs to small variant but gives attractive offers and caters to all types of teachers be it private or government employed. Compared to other similar range of cards like money back card (best for online shopping) or solitaire credit card for women, this card stands good for its uniqueness in design (for teachers) and also extra reward points on shopping at weekends is another cherry on the cake.